Hi there dear friends!!! I hope today finds you enjoying the warmer weather, the longer days, and the hint of spring that is right around the corner. I have two colorful and fun cards to share with you today! 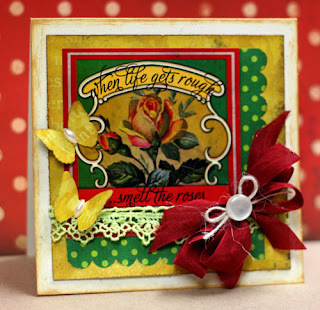 The first card is made using Glitz Design's amazing Scarlett Collection. These papers are full of bright vivid colors and patterns. Perfect for brightening up anyone's day! 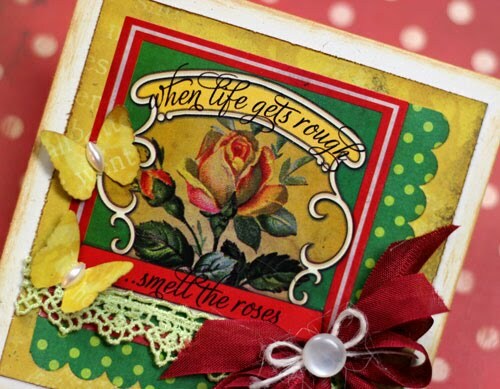 I just love the sentiment on this Scarlett Collection Sticker...When life gets rough, smell the roses. PTI Rustic White Cardstock; Tim Holtz Gold Paint Dabber; Stampin Up! Seam Binding; PTI button twine; lace, button, and jewels from my stash. Stampin Up! scallop punch and Martha Stewart Butterfly punch. the second card features a couple of Glitz Design Stickers. 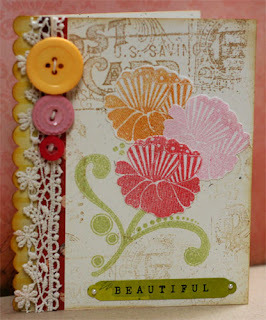 To make this card, I used the Clear Distress Stamp set to stamp the background of my card base. I just love the Post Card Image! Next, I stamped the Distressed Couture Flower Clear stamp onto Claudine Hellmuth's Sticky Back Canvas three times and cut each image out. 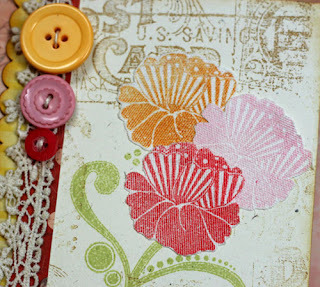 I stamped the flower once more onto the card base in Shabby Shutters ink. I adhered the canvas flowers to the card base and added lace and buttons and a fun little scalloped edge. Tim Holtz Distress Ink: Shabby Shutters, Brushed Corduroy, Barn Red, and Wild Honey; PTI Ink Sweet Blush and Button Twine; buttons and pearls from my stash. Thank you for stopping by!! I wish you a day full of smile and sunshine!